dotCanada Review 2019: Is dotCanada a Good Hosting? dotCanada’s packages are well thought out and offer almost everything you can ask for. From casual bloggers to corporate website owners, they have the right solution for your exact needs. dotCanada has been in business for over 13 years and constantly strives to provide excellent service to their customers. They provide a range of shared, cloud, and reseller hosting packages to their customer base of over 25,000. Their servers are based in Canada and the United States. In addition to all of the above, you get to manage your websites through the latest version of cPanel and a web-based file manager. Additional aspects like 24/7 monitoring, Apache SpamAssassin protection, and Cloudflare CDN enable you to keep any threats to your website away. Multiple PHP versions are supported in addition to Perl, Python, Ruby on Rails, and cURL. Plus, with the help of AWStats and Webalizer, you can easily analyze the performance of your website and make adjustments accordingly to get the best returns and keep your visitors happy. As far as e-commerce features are concerned, you can utilize the osCommerce online store management software, Joomla!, or the Agora Shopping Cart to get your online store up quickly. These applications are included with every hosting account and can be easily set up using a one-click app installer. Perhaps the best feature for casual website owners is the free website builder offered by dotCanada. With this builder, you don’t need any coding skills to create websites that look elegant and professional. There are three different packages on offer. They are named the Starter, Perfect, and Business packages. They offer pure SSD storage, though this isn’t unlimited — dotCanada is pretty up front that there’s really no such thing as “unlimited” resources with hosting services, and that at some point every customer will run into hidden limitations. That said, they seem to contradict themselves by offering what they call “unlimited bandwidth” with all their shared hosting packages. If you dig through their terms of service, you’ll find that they reserve the right to suspend your account if you exceed a 2% consumption of server resources for a period of 30 seconds or longer, which is fair enough in a shared hosting environment. The Starter package allows four domains only while the other two allow unlimited domains. Unlimited email accounts are also available in all packages, with the storage for email accounts growing with each successive level. The value of each of the packages can be judged from the fact that the Starter package does not offer any free SSL (though it does include a free one-year domain registration). The Perfect package offers SSL for free for a single year, while the Business package offers free SSL for the whole duration of your hosting package. You can opt to pay upfront for each month, a year, two years, and even three years. The longer the duration of your upfront payment, the cheaper it is for you. dotCanada also offers an unconditional 45-day money back guarantee. As far as tech support is concerned, you have 24/7/365 access to their live chat as a customer — though you’ll have to login to gain access to this. In addition to that, you can create support tickets and access the numerous articles that they have put up on their website to help you find your way around their features. Support for sales and billing isn’t provided 24/7, however; you’ll have to get in touch with them during office hours to get your queries answered. dotCanada performs well overall when we consider the individual features they have to offer. There is hardly any downside to their packages and they are worth their price. 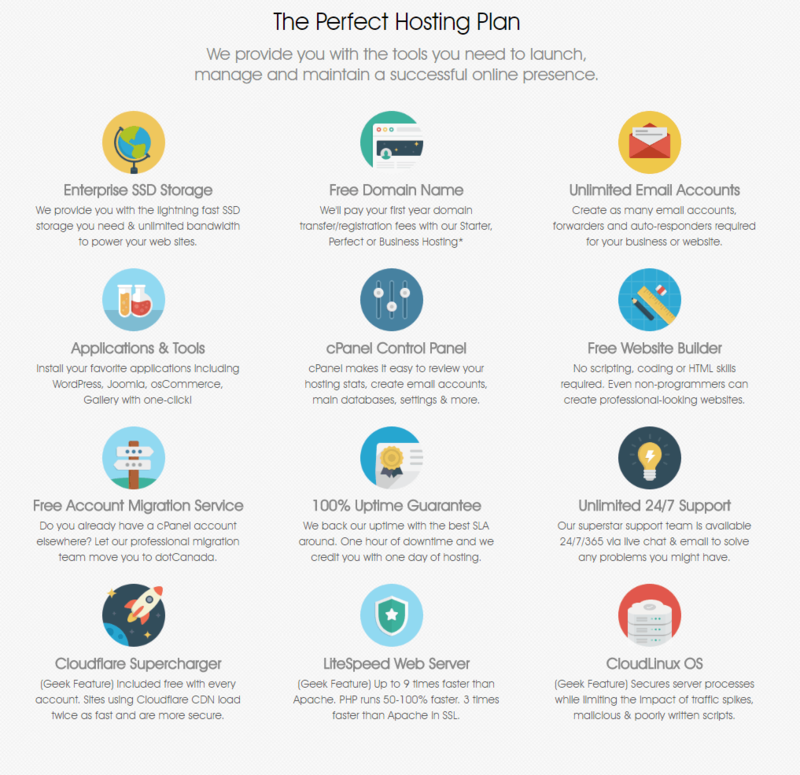 Wondering how dotCanada stacks up against other Web Hosting companies? Enter any other Web Hosting company and we will give you a side-by-side comparison.